Even just setting out this list is a reminder to me of what a huge and diverse country this is, and how much of it I still have to see. It also is a tribute to the many people who've contributed to this forum and their influence on the innumerable choices made in the planning of this trip over the last couple of months - Thanks to all of you. 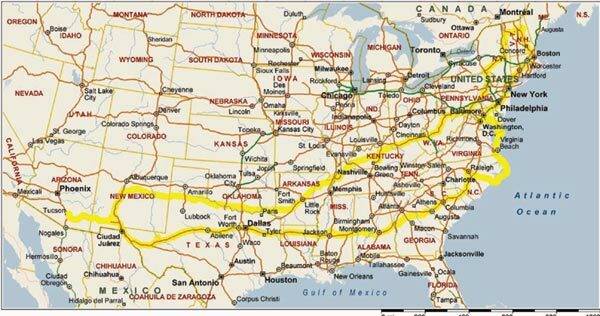 OK - I'm nearing departure on this year's big road trip, which will take me across the southern US to the mid-Atlantic coast, then up to northern New England, and finally back home through Appalachia and the Red River valley. I tried to attach a route map but couldn't make one small enough to upload. .. I gravitate to geologic, historic and quirky sites. One of the best sites for exploring Texan locations is Texas Escapes. We look forward to another one of your superb field reports! Last edited by Mark Sedenquist; 06-12-2005 at 11:34 PM. Thats quite the trip you've got planned out there. I definately will be awaiting how it went. "...Feelin' my way down a blue desert highway..."
Wow, you've got a great trip planned. Some of your spots to stop are really intrigueing like the Bonnie & Clyde ambush site. You're obviously a master road-tripper so I'm giving you this little critique knowing that you've probably already thought this through but, here goes....have you considered not doing any stops in New Mexico this trip? I'm thinking most of those stops are close enough for you to do on a long weekend. Why waste time on them on this trip? I think I'd zip to Texas and start sightseeing there if it were me. And leave the nearby NM sights for shorter roadtrips. I anxiously await your trip report! Exactly! Note that on the outbound leg I just have two stops before I hit the southern US, both of which I've wanted to get to for a number of years. I have a little bit of extra time on the return and so planned the stops in NM so that I could hit those I had time for but could drop them all if need be, and they drop off from the end, VLA first, Pueblos next, etc. Good Eye! OK – Let’s start with the bottom line. This road trip covered 7244 miles and 25 states in 16 days. Oddly enough, at no time during the trip did I feel pushed or overextended. This was not a trip of grand “must sees”, but rather a chance to get back to the joy of being on the road and enjoying the sights and sounds of small town America, looking into some of the less celebrated historical locations, and trying to search out unique eating experiences. It succeeded far more often than it failed and also gave me the opportunity to check in with my family after too long an absence. That having been said, here are some of the highlights. Day 1: The objective was just to lay down some miles and get the trip off to a good start. I did quite well in this regard, making 599.3 total miles to Pecos, TX, despite the fact that I lost 2 hours to time zone changes. This included a little side trip to Mentone, TX. Mentone is the seat of Loving county. The entire county has a population of 67 and is one of those places I had promised myself I’d go see if I ever got the chance. Mentone is essentially a ghost town with the only well maintained building being the county court house. One unique thing that I couldn’t help but notice is the speed limit on the road (state route 302) that is the backbone of Loving county. The speed limit on this two lane blacktop is 75 mph! The speed limit on nearby Interstate 20 is only 70. Day 2: This was another day to put in some serious driving, and I made 624.1 miles. The only stop was is in Dallas to see Dealey Plaza and the Texas School Book Depository. This was a very disappointing experience. This site has been seared into my memory ever since high school. It still looks pretty much the same, but for the rampant hucksterism. You can go up to the sixth floor of the building and even look out the window next to the on Oswald shot from (the actual window is enclosed in a glass booth), but by this time you’ve paid $4 to park and $10 to enter the ‘museum’ which is not much more than reprints of images and data well known to everyone who lived through this. Actually, I was struck by the relatively small number of visitors who seemed old enough to remember the event. Outside, the ‘grassy knoll’ and nearby areas are most heavily populated by various conspiracy theorists and Japanese tourists. So after a short meditation on the transitory nature of history, I hit the road again. Day 3: This marks my first return to the deep south in many, many years and I have a backlog of sights to see. First up is Gibsland, LA, the town where Bonney and Clyde were gunned down. There’s just a stone marker beside the otherwise empty road to note the actual spot. There are a couple of little museums in town, one looks ‘official’ while the other is clearly commercial. However, I arrived early on a Sunday morning and nothing was open. In fact, as nearly as I can tell, I was the only thing stirring in Gibsland this morning. So it’s on down the road to Vicksburg, MS and the National Military Park. As I worked my way around the park, it was not obvious at first how the two sides had faced each other. The park road first follows the Union lines and then wraps around and follows the Confederate lines. The area has become overgrown with trees and brush and you can’t really see the opposing lines until you stop and walk across. It’s only then that you realize that these people were firing canons with shell and grapeshot at each other from only a couple of hundred yards apart, and this murderous fire went on for months. I also spent some time at the recovered and partly restored gunboat Cairo. Considering the general state of technology in the mid nineteenth century, I’m always amazed at how ingenious they became when it came to killing each other. The next stop was the Mississippi Petrified Forest in Flora, MS. This turned out to be a pleasant surprise. This is a privately owned and operated site, but there’s no price gouging. For $4 I got a nice hike along a well-maintained and marked nature trail that made a very nice break in the day’s driving. I finished off the day with a tour of the archaeological site at Old Cahawba, just outside Selma, AL. This was the location of the first capital of Alabama, but it was getting late in the day, so no one was around at the visitor center. There were enough leaflets around for both the nature trail (In an odd twist, the descriptions of the flora had to do with how the inhabitants had used the various local plants during the Civil War to substitute for the things they couldn’t get due to the blockade.) and the restored buildings. When I went down to the river bank I had one of those serendipitous encounters that make travel so rewarding. A local writer, who identified herself only as Shannon struck up a conversation and in the course of a wide ranging discussion, noted that my plan to see Selma from the viewpoint of the occurrences there during the civil rights movement was a bit narrow and I should also pay attention to its ante bellum homes and the ways its attitude had changed in the intervening years. She was right on both counts, and while Selma turned out to be another one of those towns where almost every corner turned seemed to bring a new flash of memory of some old newsreels, I was also now attuned to the different feel of the current city and its residents. Today’s total was ‘only’ 504.8 miles. Well, I think that’s enough for one posting. I’ll add more installments as I get the time. You and I had different experiences at Dealey Plaza. I was awestruck to be in the place where those events occurred, and I don't remember any of the conspiracy advocates intruding on my visit (about 10 years ago) -- although there were a couple of "centers" for those folks nearby. What I remember from my visit was looking out that 6th floor window, and being able to see for myself if Oswald could have done it -- alone. As a fairly experienced rifleman, I'd say yes, he could have, based on what I saw that day (for an experienced marksman, these were not difficult shots). That made the visit worthwhile for me. Did Oswald act alone? I don't believe I'll ever know for certain, but I know at least that it is possible he did. My great-great grandfather served on a Mississippi River gunboat -- I used to know the name but cannot remember it now. Your notes made me wonder if it is the same one. OK – Let’s start with the bottom line. I have to tell you that I just drove a section of road that I was previously unaware of and learned from reading your post about your last road trip to eastern Washington. This new field report will provide ample encouragement to explore more of the south! Really, really enjoyed this latest installment. Day 4: Today I worked my way from Alabama through Georgia to South Carolina. The first stop of the day was FDR’s Little White House in Warm Springs, GA. The drive into Warm Springs was great. Coming in from the northwest, the route is GA-190, a wonderful, winding road through the pine covered mountains of the F. D. Roosevelt State Park with lots of vistas, opportunities for hiking, and the occasional resort. The Little White House takes me back to another time. What it reminds me of is a lakeside cottage an aunt of mine had in Wisconsin when I was growing up. Both were from roughly the same era. There’s just something about the use of natural building materials - wood, stone and fabric – and the general low tech appliances that is unique to the 40’s and 50’s. There’s a small museum that is quite nice but what really stands out is how far removed this was from today’s imperial presidency. I really enjoyed this stop and recommend it to anyone traveling through the area. Day 5: Today’s sole purpose was to pick up my sister at Raleigh-Durham Airport and get to the coast. She has flown down from Boston to join me for the next few days, and eventually I’ll get her home on my way up to New Hampshire. As I was heading up and passing through Fayetteville, NC, I realized I was a couple of hours ahead of schedule, so I did a quick scan of the map and headed for a nearby state park, Raven Rock outside Lillington, NC. I love finding these great, spur of the moment places. After a quick check at the park headquarters to get a trail map and some suggestions on what would fill my needs, I set off on an hour’s hike through the woods to a small river. Totally unexpected, totally unspoiled, and I had the place to myself. Anyway, once I picked up my sister, we headed for the coast through occasionally blinding rain, but we stopped to eat during the worst of it and pulled up at Cedar Island, NC to spend the night and be ready to catch the ferry over to the Outer Banks in the morning. There’s only one motel in Cedar Island, and it, too, was something out of the past. Again it reminded me of beach houses we used to rent at the Delaware shore when I was a kid in the 50’s. A very friendly and accommodating staff, a great seafood restaurant and the shoreline to walk at sunset made this one of the best stops of the trip. Miles on the Dials today: 453.2 Tomorrow we’ll start the trip up the Outer Banks and Delmarva Peninsula into the heart of the beast. Last edited by AZBuck; 09-30-2005 at 09:03 AM.